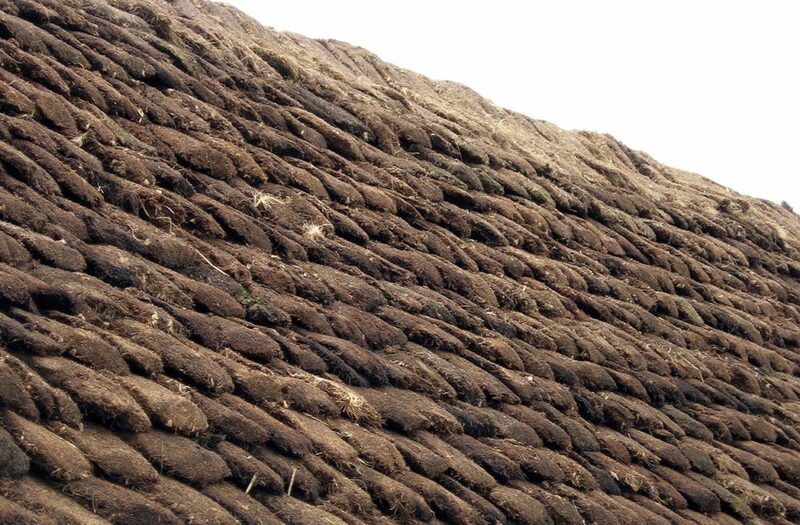 Turf… The multipurpose thatching material. Yes, cut strips of grassy lawn and field, can really keep the rain out! Although the first few inches of a heather moor are preferred; as being more robust. 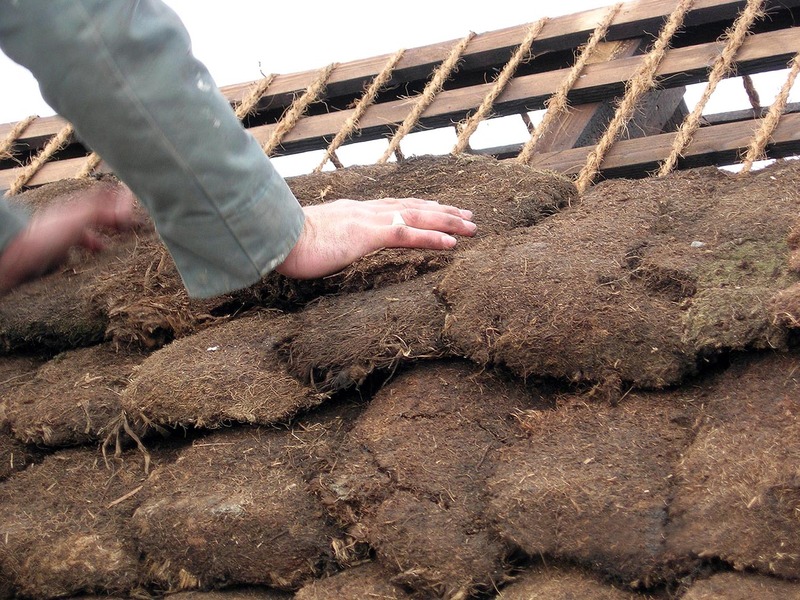 Turf is a most versatile and practical material, useful in both directional and standard methods of thatching. Yet it’s use in the craft has diminished over time; being now confined to the north of Britain. This is probably due to the hard work, of traditionally hand cutting the strips. And the fact it gives a completely different appearance, to a neat ridge of straw; when used to finish a standard thatch. 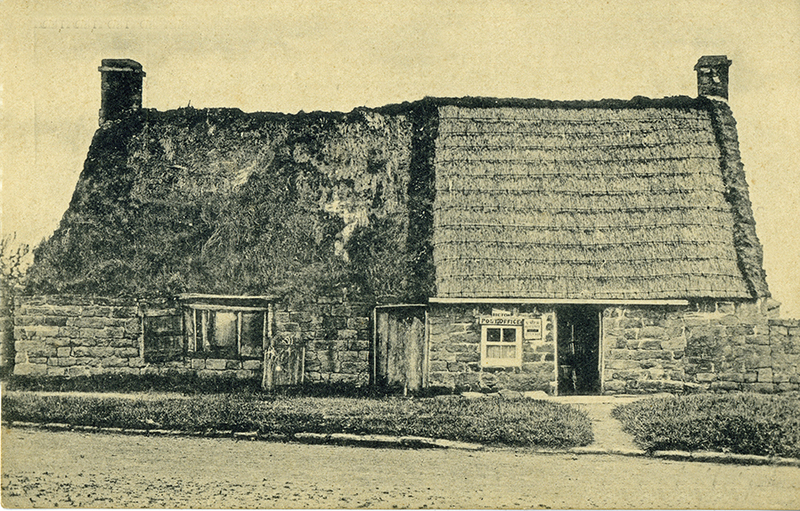 Away from the areas, where directional thatching held sway, a very large section of northern Britain, once shared many standard thatching practices…The use of turf, as ridging, being one of the techniques that set this large area apart. The extensive former use, of turf ridging, is not generally known; even within the modern craft. But is easy to see on old photos. As the turf strips appear as dark patches, on a lighter thatch roof. North to South… The extent of turf ridging… In around 1900…. On the edge…This old building, lies near the limit of using both standard thatching and turf ridging, in Britain. The craft mostly follows directional methods, further north. 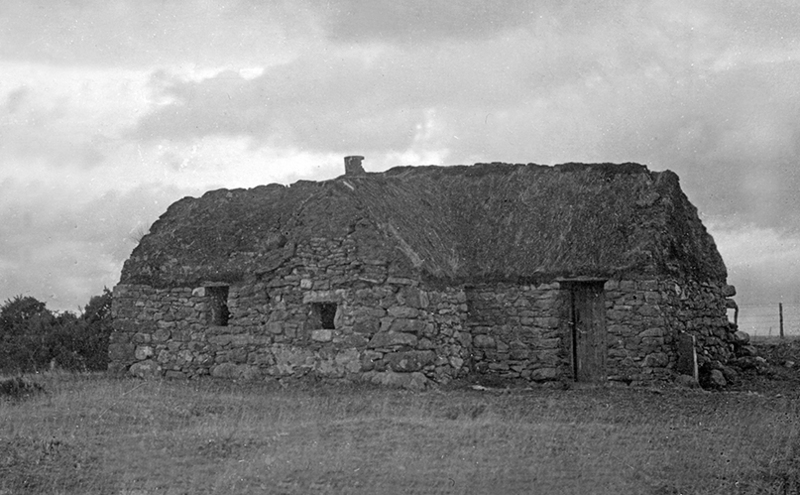 This is the only contemporary building, on the battlefield of Culloden; just outside Inverness. One of the few thatched buildings left in this area today. Happily still sporting a turf ridge. 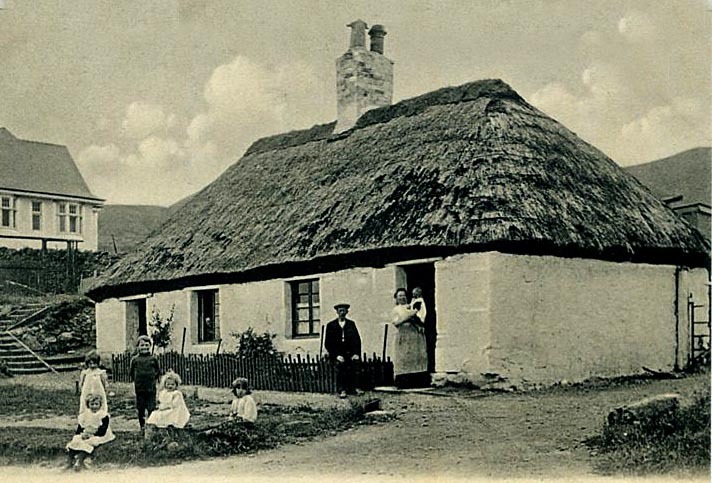 Just outside Leeds… The right hand cottage, contained the post office at Rigton. 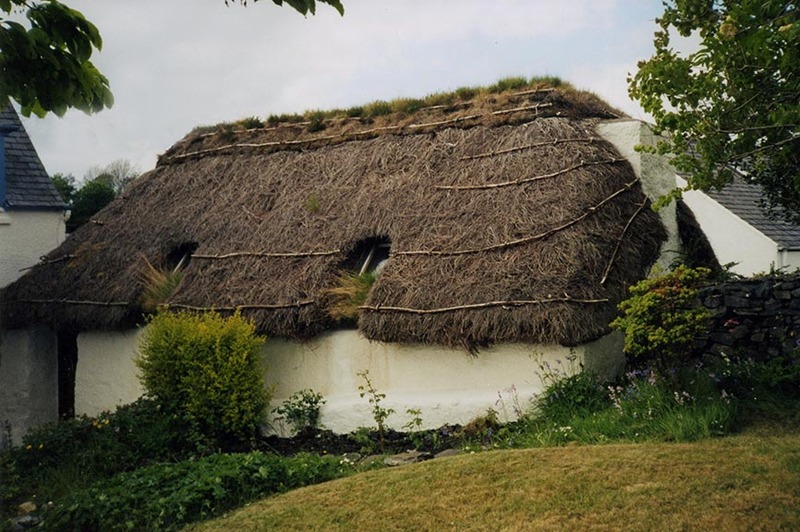 A neat coat of repairwork, is ridged and edged with turf; 200 miles to the south, of the Edinburgh cottage… It looks as if the neighbouring roof, was left to its own devices! Last stop… I20 miles or so south of Leeds. And the southern limit, for turf usage is in sight. This Warwickshire cottage is in Bilton, now in Rugby. Villages to the west of the town, claim to be in the centre of England. 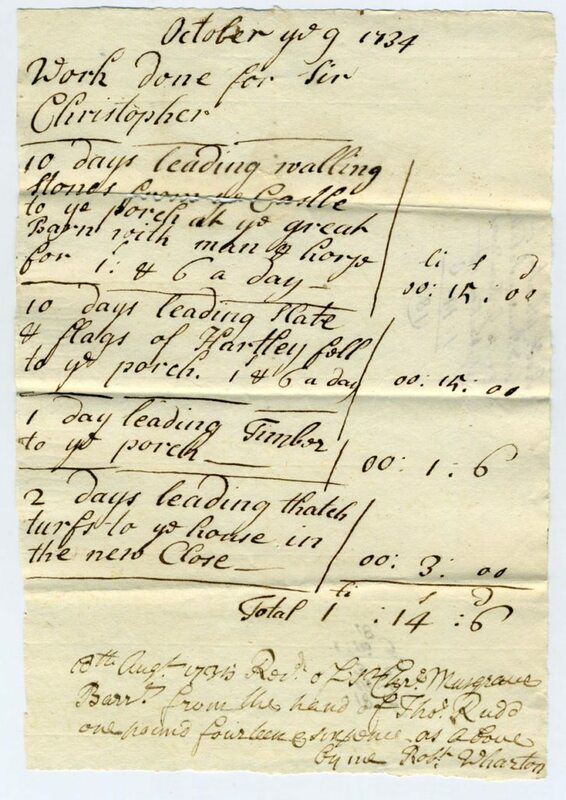 And are a very long way from Inverness… In further pages the reader will find images of similar work, in neighbouring Leicestershire; and North Wales. All dating from around a century ago. 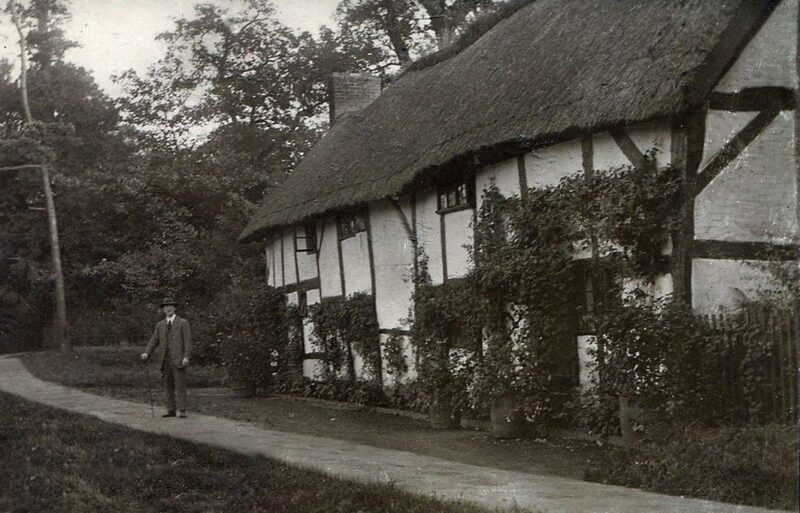 Even Ann Hathaway’s Cottage, once had such a ridge! Today, nothing but straw and sedge grass are used, in this area and for many miles to the north. On turf ridges, covering standard thatch, the turf is laid grass side up. The strips are laid over the ridge; their weight holding them in place. Appropriately sized pieces are also laid under chimneys and dormer windows… Providing a very quick and solid finish. As well as providing a useful form of ridging, (And as mentioned in the page on Roping; a type of fixing.) 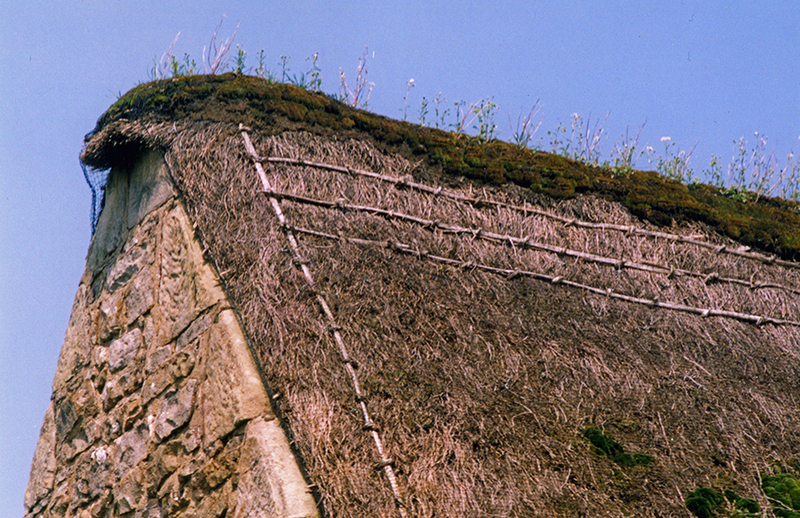 turf was also used as a base coat, for standard thatching. With this method, long strips would be rolled across the roof; and used as a bed, for sparring into when fixing the courses of coatwork. Turf is often cut with a Flaughter Spade. A form of breast plough; typically around 6 feet (1.8m) long. With these the spade is pushed forward… Hard and skilled work, cutting turves, of differing lengths, and between one and four inches (25 / 100mm) thick; depending on the tradition of the locality. The spade itself is often dished; giving a curved edge to the turf. This allows each turf to neatly overlap it’s neighbour, when in position on the roof. Turf also forms a base, for most of the directionally thatched roofs, found in Britain. It is often put on in the same fashion as a tiled roof. The shaped overlapping pieces providing a secondary waterproof layer; almost like roofing felt… Heather turf is the material of choice, being laid grass side down. This underlayer of turf can last for years. Being recoated many times, with a topping of directional thatch. Grass side down… The base coat of Easthouse Croft in Shetland. As with ridging ,the weight of the turf keeps things in place. Note the curved edges of the Pones, as these turf pieces are called hereabouts. Also the ropes, which take the place of the smallest roof timbers. Recalling a past, with little wood to spare… Photos; courtesy Burra History Group. This useful material was also used as walling, alone or combined with stone. And provided a roofing material in its own right… But turf roofs, of any size; were never widespread in Britain, and lie beyond the scope of this site.